Normally, retweets happen when a user stumbles across a tweet she1 finds interesting. But actually getting the user to retweet takes a fortuitous combination of her seeing the original tweet and then thinking it is worthy of sending it on to her followers. This is why it is so hard to initially get traction on Twitter: the odds of a tweet catching on are brutal2. As a purely hypothetical example, suppose the chance that a follower reads any given tweet of yours is 1 in 100. She just may not see it at all because she’s not online at the time. She may kind of see it, but not read it; perhaps something else is more interesting. And if she does read it, odds are against her pushing the retweet button. Let’s say (for example’s sake) those odds are 1 in 100. That means, then, the odds of any given follower retweeting one of your tweets is 1 in 10,000. If you only have 50 followers, well, 1 in every 200 tweets of yours will be retweeted. That’s a lot of tweeting for not much action. Of course, the odds aren’t fixed — the content of the tweet and the timing of it have a lot to do with it (I’ll have a post on that subject later). But over the long run, the odds of getting a retweet are disappointingly small. Of course, if you’re @BarackObama with 16 million followers, even those disappointing odds turn into a huge number of retweets. That’s why when you compare @BarackObama to @MittRomney, you’ll see that Obama is way ahead of Romney in terms of retweets — because Romney has only a bit over 500 thousand followers. Maybe, if Romney can acquire the same number of followers as Obama has and starts tweeting as often as Obama does, Romney can catch up. But given how hard it will be to do both of those, we can expect the @BarackObama Twitter account will continue to have far more engagement than the @MittRomney one. 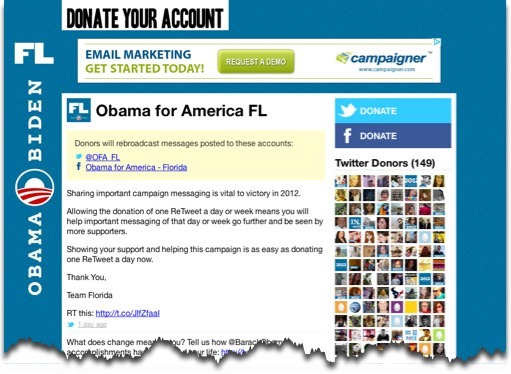 But as I described in my previous post, the Obama campaign is more than just the national organization: each state has its own campaign with its own Twitter account. And the state organizations, like the national campaign, look to retweets as a way to spread their message. But without the massive follower counts that @BarackObama has, the state Twitter accounts struggle against the poor odds for retweets like the rest of us do. You can also give them permission to make posts to your Facebook wall. 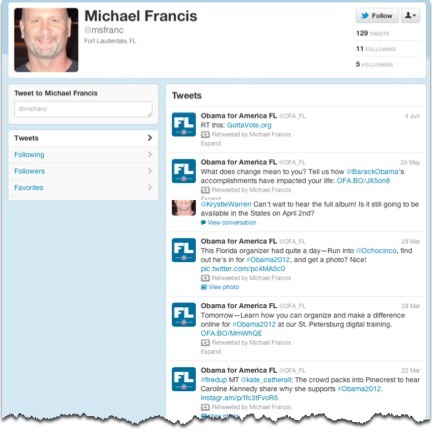 So now you don’t have to read through all the @OFA_FL (Obama For America Florida) tweets to find one to retweet. Instead, the campaign can pick one tweet a day and use Donate Your Account to send it out, automatically, under your Twitter account. To everyone else on Twitter, it appears you had manually retweeted it yourself. Brilliant! Suddenly, the odds of retweets improve dramatically, and the volume of retweets will grow. In many ways, it’s like a Twitter manifestation of an old fashioned telephone tree, where the person with the message passes it on to a couple of people, and they in turn pass it on to more people — again and again until the message has travelled to everyone it needs to reach. If all those hundreds of accounts that signed up were retweeting once a day, the total reach of these state accounts would be substantially magnified. But “If” is the operative word: while the users have done their part and signed up, the follow through by the state campaign organizations has been spotty so far. Everything is on autopilot for the users, but the campaigns still have to manually designate a tweet a day to be retweeted. A couple of the state campaigns are fairly active in pushing out regular messages, but a lot of them are not. To be clear: if a campaign doesn’t get around to pushing tweets through its DonateYourAccount volunteers, they’ve missed an opportunity. It’s unfortunate (for them) that there’s a potential here that’s not being tapped. I’m surprised that the Obama national campaign is not recruiting retweeters too, even with their massive follower counts. They could easily build their own automatic retweet application into their barackobama.com website. This would give them the ability to sign up a large, nationwide cadre of retweeters3. The Obama campaign could then unleash an overwhelming Twitter barrage in the closing days of the campaign. 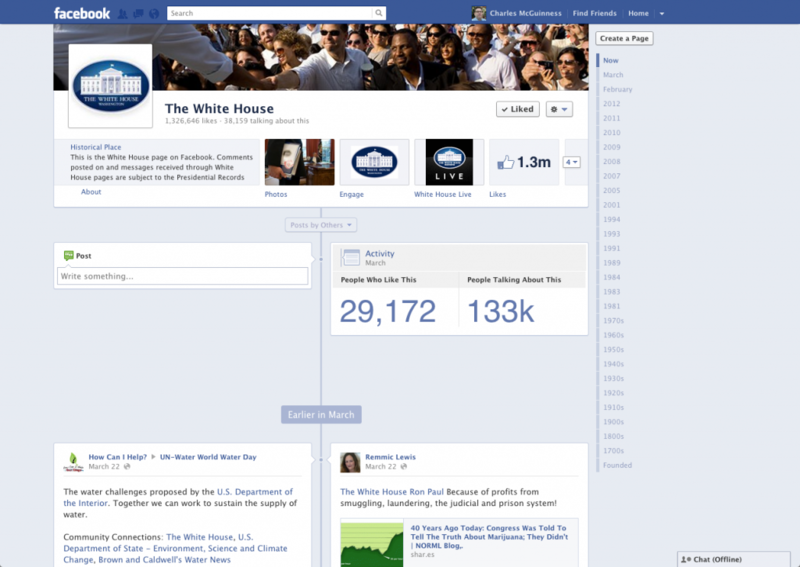 Such a move — if it worked, of course — would leave people in further awe of the Obama campaign’s social media prowess. The great thing is that kind of prowess is available to anyone today: Donate Your Account is free for everyone to use, and so there’s a great opportunity for other candidates to give it a try. A tool like this could be very helpful to down ballot candidates who have a hard time getting attention on social media; even a small handful of supporters who retweet a message of the day can dramatically extend the campaign’s social media reach. The tool is wonderful in that it allows these volunteers to participate in a way that costs them no money and requires no time beyond a quick initial set up. That overcomes another problem small campaigns have, motivating supporters. It’s win-win! For other, more long lasting organizations, the same approach will work. Charities, social groups, or schools could easily use this technology to get the word out. Businesses that have partner channels could try something similar with their partners. Even governments could use this in a variety of ways. You can sign up for the service here: http://donateyouraccount.com/ . Let me know if you try it and if it works out for you! 1) Twitter is thought to have more female users than male users.